A ranking of the personalization features of the best eGift cards from nationwide stores, restaurants and apps in 2018. Send a gift in seconds when you buy a Visa® eGift card or a Top Merchant eGift card. Looking for a last-minute gift? Here’s 200. As egift cards are becoming an increasingly popular choice for last-minute, impromptu and “just because” gifts, I am always looking for features that make egift cards more personal. Five years ago, I reviewed egift cards from top stores and restaurants to see which ones would allow me to personalize the digital delivery with a choice of egift card designs, personal photos or even video messages. I also wanted to know which egift cards would allow me to schedule delivery and choose a custom dollar amount. After launching that first review of the best egift cards available, I discovered that customers had two more basic questions. They want to know what an egift card looks like and where (how) it can be used. So I looked for those things too. Given that digital delivery is a relatively new gifting style, it makes sense that people want to know how it all works and what the recipient experience will be. For this reason, merchants that offer customers an egift card preview and accept egift cards both in their stores and online rank higher (for me) than those that don’t. Below is a list of top merchants and how they rank on the digital gift card features that I believe are most important. Find “Top 20 eGift Cards Overall” and “Best in Category” awards in the 2018 eGift Card Review. * Lane Bryant previously had an established eGift card program both on their website and mobile-enabled site. At the time of this review, both say that gift cards are not available for purchase online. * Amazon.com customers can additionally send “suggested gift” eGift cards. 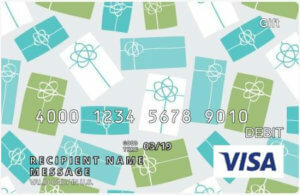 When the eGift card is delivered, it contains an image of the suggested product along with a thought bubble that says, “Thought you might like this.” The recipient can redeem the gift card for that product or for another product on the site. ** iTunes eGift cards must be purchased from the iTunes store on a computer or an iOS device. * With a $50 eGift card purchase, Sephora will treat the gift card recipient to a free custom makeover in addition to the $50 in product. * Target both additionally sell eGift cards for select retailers. Sam’s Club and Costco only sell discount eGift cards for select retailers. For all stores, however, these third-party eGift cards are emailed directly to the buyer–not to a gift recipient. * In addition to selling their own eGift card, Staples sells eGift cards for select retailers. However, these third-party eGift cards appear to be emailed directly to the buyer. In the checkout process there is a place to enter an email address, but the description implies the recipient will receive complete details for your order–including anything else you may have purchased. * Applebee’s dropped text and Facebook delivery this year. § While not completely flexible, these restaurants allow load values in $5 increments within the specified range. * eGifter exclusively sells eGift cards for major retailers. Unique from any other merchant I’ve found, this website allows the user to find contacts on Facebook and Google+. Delivery, however, is via email, text or Facebook. † GiftCardLab.com and GiftCardMall.com sell eGift cards for select retailers that can be delivered via email or text to a gift recipient. ‡ GiftCards.com sells personalized Visa Gift cards and eGift cards for major retailers that can be emailed to the gift recipient. Animated videos or personal images can be added to the delivery. * Gyft is a mobile gift card app and website that helps you organize your gift cards. 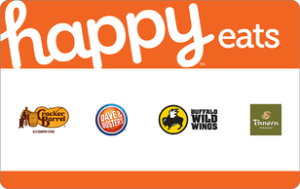 You can also send eGift cards for select retailers via email, text or Facebook. The recipient must download the Gyft app to use the gift card or log into the web-based site on a mobile phone or desktop to access it. 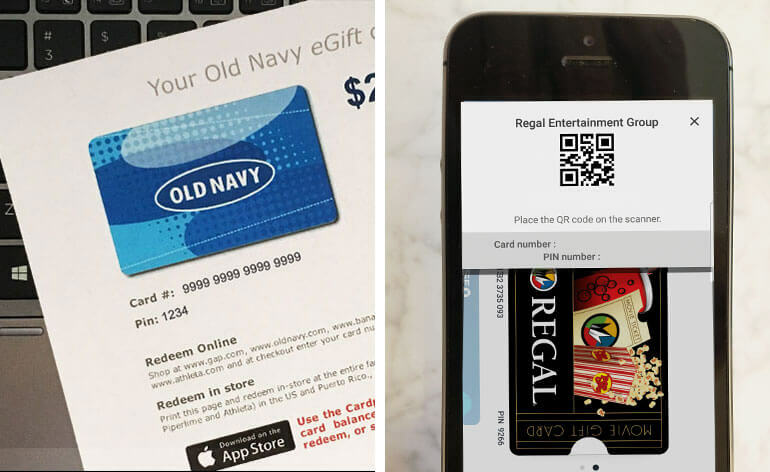 † The GiftCards.com mobile app is a complement to the company’s website. Available for both iPhone and Android phones, customers can quickly order eGift cards for Visa and other top retailers and restaurants. The primary design is the gift card logo, but a photo and one of over 100 animated egreetings can be added as well. ‡ Yiftee is a mobile app and website that allows the giver to send a virtual gift card that can be used wherever Mastercard® is accepted. The giver buys a Yiftee for a merchant and specifies whether or not the Yiftee must be used at that store, exchanged for another store or donated to charity. 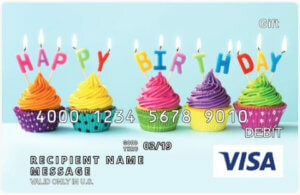 The recipient claims the Yiftee, receives a mobile eGift code (called a “Virtual Gift Voucher”) and has 90 days to use the card at the specified merchant. Unspent credit is returned to the sender. There is a fee for egift delivery. § GiftRocket also delivers a gift credit with a suggestion of where to spend it, but the recipient essentially receives money to use wherever. The gifted money can be accepted as a bank transfer, credit card payment, check in the mail or PayPal deposit. ** Giftly is a mobile app and website that delivers a Visa gift credit with a “suggestion” of where to spend it, but the recipient is free to use the credit however he or she wants. To spend a Giftly, the recipient claims the credit and has it deposited into his or her own credit card account, then uses that credit card to buy a product or service. ‡‡ GiftFly seems to have morphed into an eGift card program for small businesses. Last I reviewed, I could send a cash GiftFly which allows the recipient to accept the gift as funds deposited into a Paypal or bank account or they can send a merchant GiftFly that must be redeemed at a participating GiftFly local merchant. It looks like only the latter is true, but I couldn’t find a way to log in and test it out. Guess somebody will to send me one so I can understand the new process. §§ Wrapp also appears to be going through a transition. The current website explains that Wrapp is now a payback-app that connects directly to your debit card or credit card. You can also receive personalized offers and rewards. Top merchants in each category have been evaluated based on the criteria below, which includes features that make it easy for consumers to send thoughtful eGift cards and feel good about the experience. eGift cards that I think are best are listed first, followed by egift cards with fewer features. Although many merchants sell plastic gift cards online (and will mail them to you or to the recipient), I’m looking for a digital gift card that can be delivered electronically, such as through email, text message, social media or a smartphone app. One way to personalize an eGift card is to select a design that resonates with both the giver and the receiver. From the company’s iconic logo to seasonal designs that trigger emotions, having a variety of designs available is a must. Even better than canned images is the ability to upload your own. I guarantee there will be an uptick in mom’s psychological response to getting a digital gift when she opens an eGift card containing a picture of her grandkids versus someone else’s. If you really want mom to open an eGift card and feel loved, then choose to embed a video that she can watch over and over again. Few companies currently offer this feature, but it will become more and more popular as digital gifting takes over. Although I expect to see plastic gift cards sometimes only available in predetermined dollar amounts, eGift cards should be completely flexible, allowing the giver to choose any dollar amount (within a realistic range) that fits his or her budget. eGifting isn’t just for the forgetful. Sometimes instantaneous delivery is too fast. It’s nice when a merchant allows customers the ability to schedule an eGift card delivery for a later date and time. While you can open websites on a smartphone browser, mobile-enabled websites and merchant apps that are customized for egift card delivery and use make the process easy. For this feature, I’m looking for a gifting experience that can be initiated on a smartphone and received just as easily. Customers want to know where eGift cards can be used. Although ultimately I believe all gift cards will (and should be) redeemable at every outlet associated with a merchant (online, in stores, in outlet stores and so forth), we aren’t there yet. Merchants should clearly state where their digital gift cards can be used, especially if there are limitations. Consumers want to know what the eGift card looks like. Is it just an email? Does it have a bar code on it? Is the recipient required to log in to your website to see the eGift card? Although most merchants have a product selection type of preview (meaning I could see the egift card design selected), only a few show a true preview of what the receipient will get. 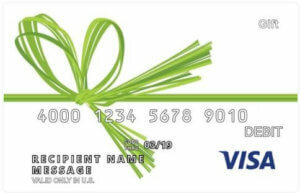 For more information on eGift cards, read Gift Card Girlfriend’s Complete Guide to eGift Cards. After another year of reviewing the best egift card programs and using egift cards, I have to say that although we are doing better, the transaction still isn’t totally seamless just yet–no matter which merchant you use. In fact, it seems even the merchants are still trying to figure things out. Several merchants removed social connection from their egift card programs and a few removed texting as well, making email the predominant egift card delivery method. Also, though I wouldn’t accidentally give a plastic gift card to someone I don’t know, I have sent egift cards to the wrong email address. I sent my daughter a quick egift card from Starbucks, but got alarmed when she said she didn’t receive anything. Would you believe I entered her email address incorrectly? I pulled her email address straight from the contact list on my smartphone where I had apparently entered it wrong months earlier. (We typically text and Snapchat each other by phone. Never email. Obviously.) Thankfully, Starbucks was able to recover it and re-route the card, but not all merchants have that capability. So be extra careful when entering details and reach out after you send a gift to be sure the recipient got the surprise. Despite the pitfalls, this electronic gifting and mobile wallet thing is really happening. So I’m here to help us all get through it. Did I miss a favorite merchant of yours that has a really great egift card? Has your egift card program been updated? Let me know in the comments below and I’ll be happy to take another look. Where Can I Buy Printable Gift Cards? Over 40 brand name egift cards you can print at home. Read More » about Where Can I Buy Printable Gift Cards?